Yes, moving along by degrees across projects - thanks for your kind words. I tried to do the late-season covers on the '69, whereas early season (including the Mid-Ohio images) witness the headlamps in place and taped. I think we both have the Riverside Mission Bell 250 poster with the terribly muddy (literally speaking) '69 Donohue Camaro at MIS, and again, taped standard headlamps are seen. Pressing further into the season, my Car Life issues depicting the Penske team Camaros at Sears Point and Riverside feature more prominent cover or plates. I think the diameter of the same grew, but perhaps the fluorescent paint (or yellow paint dependent of course on who's ride I'm gazing at) distorts my perception of what is there? Mike, you are right. There are larger covers at the end of the season and I was just forgetting that detail. There are supposed to be headlights installed and whether there are (or are not) any behind those covers is anybody's guess. 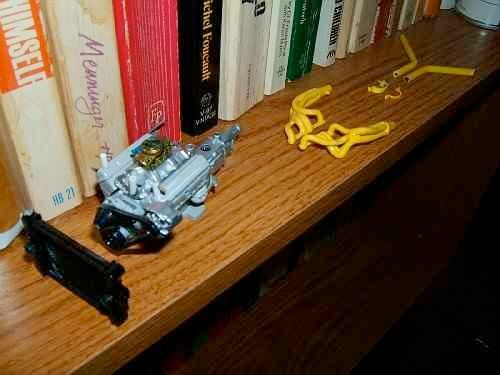 Penske might have gotten away with one. Of course, according to the rule book there were supposed to be windshield wipers on the cars also but depending on the race or car, many times the wipers are not installed. If you got by tech and nobody cared enough to protest, you got away with it. As examples, other cars that used covers over the headlights are Freddie Van Beuren's Mustang at Sebring in '67, Shelby's '68 Mustangs and Bob Grossman's '69 Camaro at Daytona (last one not T/A though). 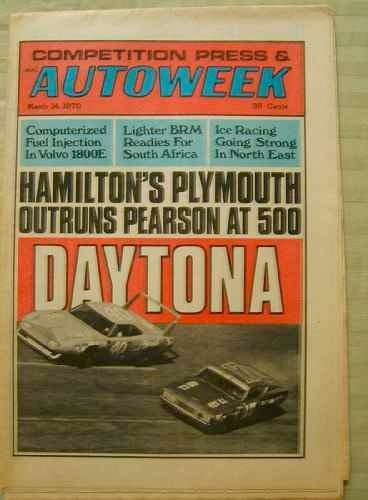 Penske was never bashful about trying to improve aerodynamics. Witness the trimmed roof drip rail on the #15 car at Sebring in '68, the vertical windshield wipers, the occasionally taped-over windshield chrome, cheater spoilers, etc. The headlight covers could be included in that group. Modest material progress, but more supplies and further options then. 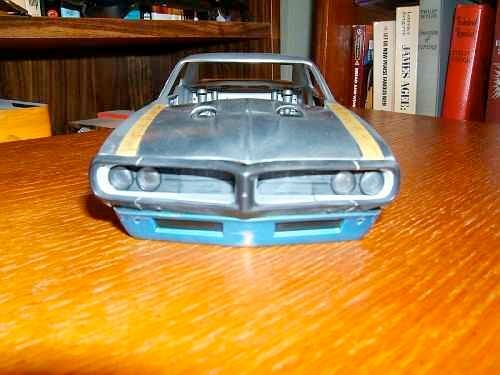 Front valence panel from 1:18 Lane '68 Firebird far from an effortless swap onto the 1:18 Yat Ming '69 Trans Am tool, and even for having an option to splice two, this isn't the route I desire to take. 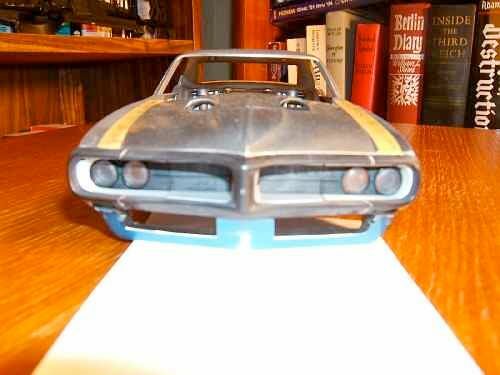 What is seen here is a 1:18 Ertl Authentics '67 Z/28, whereas the valence panel is far closer to what is desired dimensionally, whereas cutting same from 1:18 GMP '67-'68 Trans Am Camaro would be cost prohibitive. I delayed final fitting of the Lane inner panelwork until I could solve the front valence issue, and if I can pin the entire assembly together (i.e. fenders and front valence panel), then the resultant assembly will be that much stiffer to accommodate the metal work. Two-part adhesives or perhaps JB weld will be used to bond the panelwork less pins. I hope to fabricate ductwork/fresh air dams as visible behind the valence in a image culled from the Wolverine Trans Am photo collection/reportage thread - thanks Jon! Faux front side marker aluminum fill panels to be fabbed and overlaid, too-conservative initial cut lines inked onto Camaro shell to be lowered - ah, the utility of a digital camera is further proven to me again! 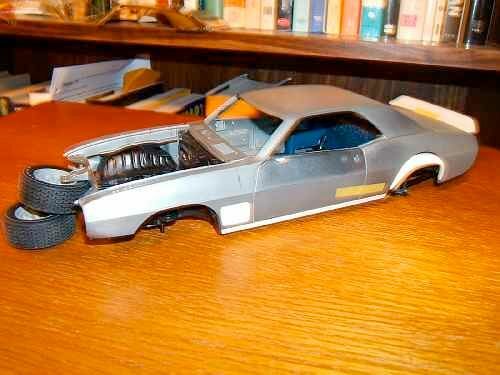 ...(another scale victim) valence to be fitted, surrounded by unwanted '67 Ertl Authentics Camaro panelwork. 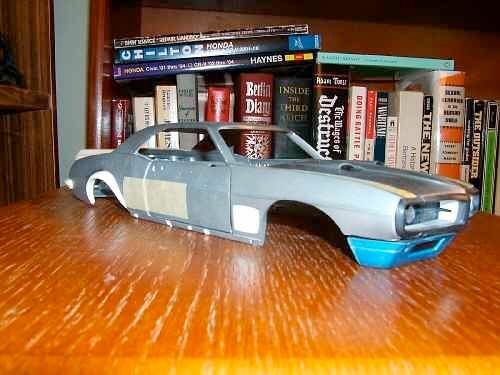 The pursuit (or rather fabrication) of the best 1:18 Goodyear Blue Streak Sports Car Special that might be had. Seen are images from the '69 Mid-Ohio thread (thanks Jon! ), a slate of 1:18 tire options, and a slate of 1:24/1:25 tire options. Combining shoulder design/bulge/section size to thread width and design (if applicable), the aim is to cast all of the 1:18 options in hard resin, experiment with abandon, and then cast in more pliable and black-tinted resin. Tread may be hand etched for no scale 'dries' exist. The 1:24/1:25 tire options include sidewall lettering that may be cut out and introduced into molds for the larger scale tires. 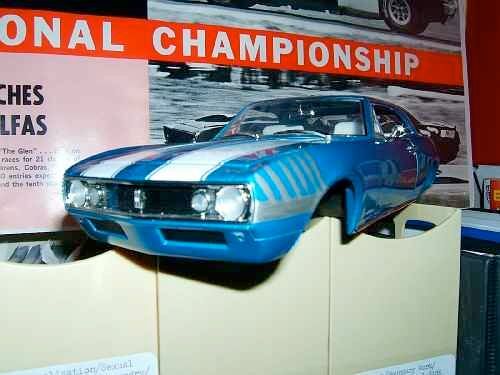 These include 'FOR RACING USE ONLY', 'BLUE STREAK SPORTS CAR SPECIAL', and size identification. GMP 'footwear' not terrible, but a bit square of shoulder (contrasted to center top option especially), a bit narrow in back, a bit tall of section in front. 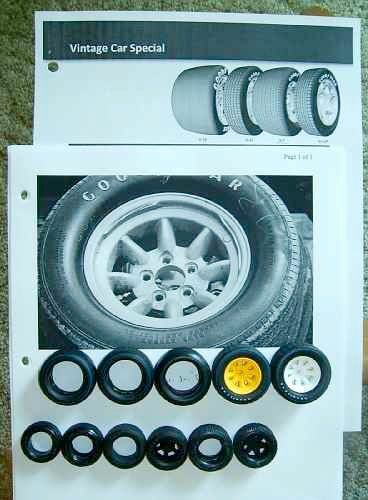 Top photocopy image from Goodyear illustrating contemporary vintage racing tire range and tread designs on offer. Thanks. Thanks for the further update, Mike. That front valence work looks tricky and complicated but I'm sure you'll work your way through it. That's terrific that you are finding the tire pictures (and others) from the Mid-Ohio and Wolverine Trans-Ams being very beneficial to your efforts. Really cool that you will be able to recreate the smallest details such as the "For Racing Use Only" writing and also cast them in pliable black resin. ...head on, hardly a thing of beauty, but about what is needed. ...a bit thick yet, ready to break pack ice with that prow. Artic expedition anyone? Nice progress Mike, The front is looking very close to the real thing, The indicator overlays did look crude on the real car, but they did the trick at minimal cost. Mike, definitely some more trimming and shaping to do with that piece but something very useable to start with. I suppose you and Bruce may be right about how the overlays will be received by others. That is always the issue with models that are absolutely correct, and the same is true for full size restorations. We have all seen properly restored race cars that have their quirks and stranged facets, but it is those details that make them correct. i'd rather have them "right" and perhaps questions, than the way people expect. Juat as long as the facts and pics can back up the restoration. More great work Mike. Keep it up. Heavy filing of front valence openings, shape of each now far better. Thanks for the continued kind interest and informed feedback. ...some work to be done still to disguise a casting as a stamping; i.e. thinning visible thickness of the valence, determine utility of using use of exposed metal surfaces remaining to simulate radiator and oil cooler fresh air dams, etc. The plastic grille surround here is wearing a coat of silver paint, whereas in the early '69 season photo seen below, it is painted black. Envision the same painted semigloss black or late-season aqua and the final appearance of the total assembly is better conceptualized. 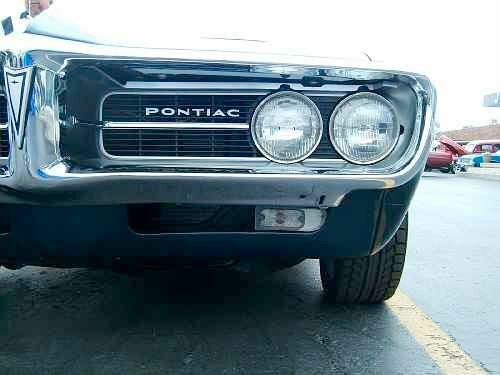 ...a reference photo prior to later grille work undertaken. The need for some material removal along the bottom of the valence is detected here, whereas the entire assembly still needs to be raised a bit. Shape of openings need tweaking too! Indicator overlays likely a weekend project. Looking much better, Mike. You have a complete grasp of what needs to be done, based on your comments. I'm really looking forward to more progress on this car. Seemingly modest stuff, but labor-intensive and hence reportable. '69 Yat Ming shell filed out to allow use of '68 Lane cowl, channels used to positively situate hood in place for both bottom surface and side to side placement of the panel, and reuse of Lane underhood fender detail stretching atop each wheel arch liner. 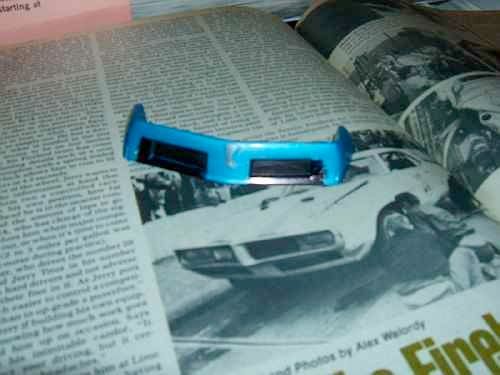 Chassis '69 Hwy. 61 Camaro, as are the aforementioned wheel arch liner (or whatever these things are called!) which feature strengthening ribs that I judged worth saving. The Lane firewall is held in place with a machine screw that holds it fast to the bottom of the cowl, and this too can be seen. Heater core assembly has been cut out, the resultant hole is awaiting a plug. Work to come to play with final shape, rib configuration, and rollcage extensions stretching in and across from interior. Pockets for upper control arms (likely GMP Trans Am Camaro) to come - gee, a model with visible caster so far as how the aforementioned will be sited! ...the general direction I wish to go then. 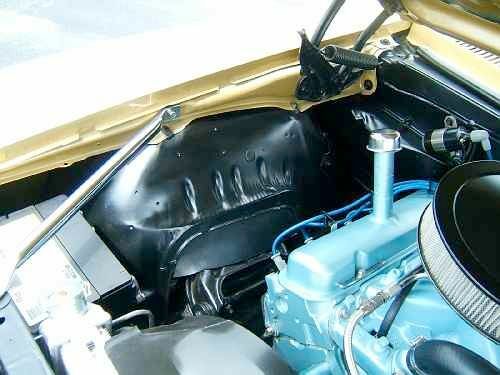 ...the cowl, hood mount 'channels', and radiator support in place. Note plugs for side view mirror on door castings, plugs in holes for standard Yat Ming exterior door latch assemblies. 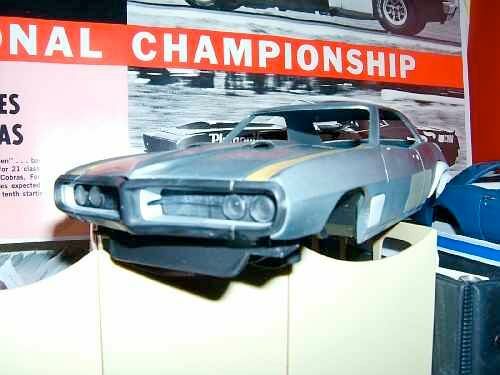 The later will be drilled again, facilitating the use of far better Lane '68 Firebird items. ...top view, no glue yet, likely JB Weld used to fix in place with brass pins or rods to positively site. Will have to pull back cowl a bit, shorten hood at the front a bit as well to disguise modest dimensional difference seen here. Generally encouraged for this constitutes the nastiest aspect of the bodywork filing, and now slightly nearer to completion it is. So easy it is to stack parts, but so difficult to DO something with those parts! Bare of radiator, braces to each fender and other bits, hard it is to fully assess what detail has been 'fought for' here. 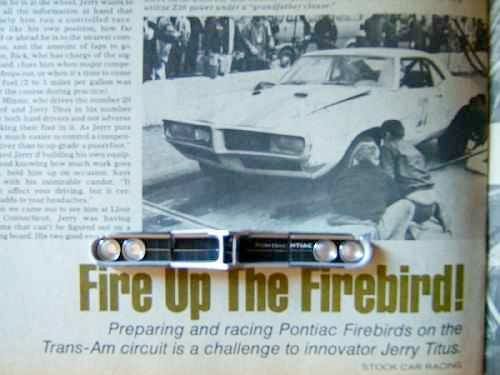 The Lane underhood parts for their rendition of the '68 Firebird are fine, whereas the core items seen here aren't particularly glamorous to contemplate. Thanks for examining this post. Thanks once again for the update, Mike. Lots of little details have been done. I wonder why they cast a big divot into the rear/upper part of the front fenderwell like that. Are you going to leave well enough alone there? I suppose it would be quite a bit of work to make it reflect what the original contour was. Thanks for your kind attention. Indeed, imperfect shapes to work with, but something of a start. 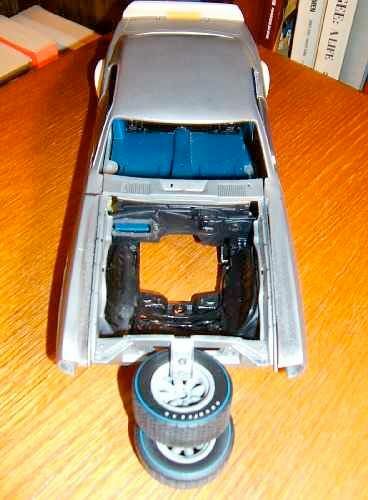 Both unassembled plastic and preassembled and prefinished diecast evidence no end of engineering 'cheats' to allow for ease of production and/or the inclusion of working features not always sympathetic to the calm and accurate reproduction of other detail. Worse sins are hidden underneath, for the subframe rails in the back of the model are not quite where they should be relative to the travel of the axle up and down. Back to the matter at hand, the blunted shape/recesses witnessed to the rear of the wheel arch liners I believe are there to allow the stowage of oversized scissor hinges. Golly gee - scissor hinges! - or so says the typical buyer. The liners have already been hacked down a bit, whereas I'll endeavor to restore the shape now missing towards the back of each. No, I'm not sure about which hood hinge design to employ here across a range of manufacture options. As implied by the photo reference, further work is needed to hack out the upper control arm recesses, whereas I doubt the rubber weather guards were bothered with by T-G. The exact pattern of strengthening ribs can be played with too - sanding off some, extending others, and filling in what requires disguise. It will be nice to add the underhood roll cage extensions, with the same seen across period photos and not terribly hard to fabricate given their simple shape. The control arms are being cleaned up in anticipation of casting copies, whereas the mounting platforms for the same extending off the top of the subframe will be better controlled for shape versus the combined 'cast as a piece' GMP effort. Perhaps some threaded shock absorber top mount detail with a nut will be added for good measure. Sway bar mounts/links/bar seem akin to what Penske employed, whereas strange to report that while all GMP Trans Am Camaros have rear bars, none feature a front!